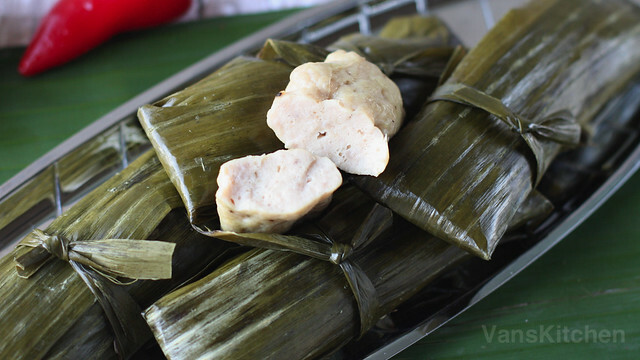 Another authentic Vietnamese taste: Cha Hue, literally Hue style ham or pork roll, is a delicious finger food made of lean pork, tapioca flour, garlic, black pepper and nuoc mam (fish sauce). You'll never want the preservative-loaded store-bought version again. 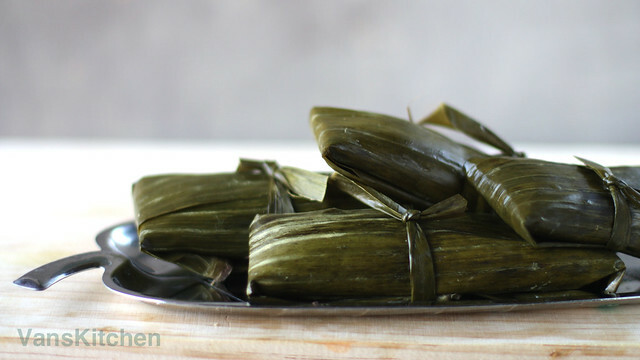 It can be eaten hot or at room temperature, or added in Bun Bo Hue. In a mixing bowl of KitchenAid Stand mixer, use the paddle attachment, mix together ground pork, sugar, salt, oil, fish sauce, and few small ice cubes. Then cover with wrap and put in freezer for 3 hours or until the meat is extremely chilled without actually freezing it. Take the meat out of refrigerator, grind the meat, then cover and return to the freezer to chill down again, for about 2 hours. Repeat grinding one more time until they are very finely ground and always keep it as stiff as possible. After grinding the second time, if the meat is not very chilled, you may have to place it in the freezer again before the next step. Do not make the meat become warm if you do not want it tends to be mashed through the grinding plates, turn mushy and lose all of the juice in the meat. You will also notice that once meat has been minced, there is far more surface area for bacteria to develop, which is another good reason to keep it cold. Add pepper and baking powder; Add garlic if you use it. Stir well. In a small bowl, mix well tapioca flour with 2 tbsp cold water. Then add into the bowl. Continue mixing at medium speed for 5 minutes, or until the mixture is well combined. Don't forget to scrape down the bowl and beaters in between. 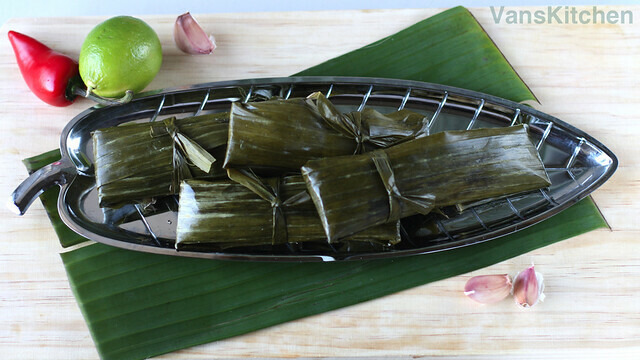 Wrap the ham paste in banana leaf, tighten and place in the steamer. Steam for 45 minutes or until the meat is cooked. Let them cool down, then serve. You can make a lot, then store in the freezer for several months.